Who is the real Lacy Johnson? After entering into a plea deal on 6 felony counts in Los Angeles, Lacy Elizabeth Johnson served just 15 days in jail. She was released on June 1, 2017. Lacy Johnson is a convicted felon and will be on probation for the next 5 years. She has been ordered to pay $129,743.41 in restitution to 14 victims/institutions (totals for Los Angeles only). Any violation of her probation will result in a minimum prison sentence of 6 years and 4 months. On May 19, 2016, Lacy was arrested (while out on bail) for 3 counts of Identity Theft in Santa Clarita, CA. She plead not guilty on each count. On January 23, 2017, Lacy changed her plea of Not Guilty to No Contest on 6 felony charges in Los Angeles (1 count of Burglary, 1 count of Grand Theft, and 4 counts of cancer fraud). She will serve 6 months in jail, placed on 5 years probation, 30 days of community service, and has been ordered to pay restitution to her victims. On January 24, 2017, Lacy entered into an open plea of Guilty on the 3 felony charges on Identity Theft in San Fernando. The plea includes no jail time. Lacy is ordered to make monthly payments of restitution, given an additional 30 days of community service, and placed on 5 years probation. Any violation of the probation (any further crime/arrest) results in a jail sentence of 6 years and 4 months. According to her attorney, Lacy's father passed away on August 14, 2016. After numerous false claims made by Lacy of Jon's death dating back to 2010, Jon's passing has been confirmed. Dating back to 2006, when she worked for Film Garden Entertainment, Lacy has been telling people that she has Stage IV breast cancer, brain cancer, or ovarian cancer. It has been verified by the LAPD that Lacy does not have any type of cancer. Lacy has also given some of her victims a variation of her false cancer claims, with her father (Jon Matthew Johnson) being the one with some form of terminal cancer. On at least 4 different occasions, Lacy has told these victims that Jon died from his illness. On one occasion, Lacy told her now ex-fiance, his parents, and her boss that her father died of a heart attack. Lacy had told one of her ex-fiance’s that she had Stage IV brain cancer. She took $15,000.00 from him for her “ozone treatment.” His parents also gave her almost $9,000.00 for ozone treatments for cancer that she deliberately lied about having. Lacy told a former employer that her brother, Morgan Matthew Johnson, committed suicide on April 23, 2010. Lacy then went on to tell her ex-fiance in July 2010 that her brother Morgan Matthew Johnson died of a drug overdose on July 4, 2010. Morgan Johnson is alive. Lacy opened a credit card in her ex-fiance's name without his knowledge and began charging things to it. Her ex-fiance filed a police report and Lacy had been charged with identity theft. That charge was dismissed during a preliminary hearing on July 27, 2015. Lacy had worked as an assistant for a woman in Hollywood Hills with an online store in 2010. Over Memorial Day Weekend, Lacy broke into, burglarized, and vandalized the woman’s home. She stole thousands of dollars worth of clothing, shoes and jewelry. Lacy was arrested on Tuesday September 14th, 2010 and charged with grand theft and burglary. Lacy has previously told people she has a show on the Food Network Channel. According to executives at the Food Network Channel, that is a lie. She has also claimed that she is a producer and has connections to HBO, NBC and other networks. This also has been verified to be false. Lacy has never had a show produced by any of the Networks, nor has she ever sold a show or pitch to any Network. 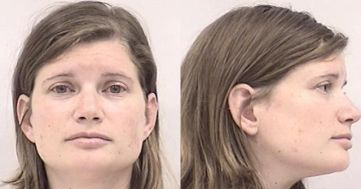 Lacy fled to Colorado Springs, CO in the summer of 2011, where she began making false claims of operating a non-profit organization called Care Package Bears. She created a Facebook page and website for this unrecognized organization so that she could fraudulently collect donations under the ruse that those donations would go toward making care packages for United States Military serving overseas. Here is a message that Lacy sent as the admin of the Care Package Bears Facebook page confirming her “re-location” to Colorado. Since Lacy Johnson’s crime spree has begun, she has managed to scam approximately $472,500 from those victims that have come forward. THIS WEBSITE IS FAR FROM COMPLETE. MANY OF LACY’S CRIMES HAVE NOT BEEN LISTED ON THIS SITE IN ORDER TO PROTECT HER VICTIMS ANONYMITY.